The Economic and Financial Crimes Commission will soon begin the probe of the nation’s oil and gas industry as part of the current anti-corruption war of the President Muhammadu Buhari-led administration. The roles of some principal officers in the former Goodluck Jonathan administration, including the former Minister of Petroleum Resources, Mrs. Diezani Alison-Madueke; her counterpart in the Ministry of Finance, Dr. Ngozi Okonjo-Iweala; and an oil magnate, will come under intense scrutiny. The Acting Chairman of the EFCC, Mr. Ibrahim Magu, said this in Abuja when he appeared before the House of Representatives Committee on Financial Crimes to defend the commission’s 2016 budget proposals. In his presentation before the lawmakers on Monday, Magu tactically avoided giving direct answers to questions on whether Alison-Madueke would come under the searchlight of the agency. The anti-graft agency’s boss merely responded to such questions by saying, “The commission will soon move into the petroleum sector”, but called on the National Assembly to support the efforts of the agency by making more funds available for its operations. Shortly after the presentation of the EFCC’s chairman, however, a member of the committee, Mr. Razak Atunwa, told reporters that Magu actually informed the committee that Alison-Madueke, Okonjo-Iweala and the oil baron would be investigated. Atunwa was the lawmaker, who asked Magu the question on whether the commission would probe the oil sector. Atunwa added, “I said the EFCC has recovered a lot of money for Nigeria and he (Magu) mentioned that in that regard, more sectors of the economy are likely to come under investigative activities. The PUNCH had, in October last year, reported that Switzerland might extradite the oil marchant to the United Kingdom. The Office of the Attorney General of Switzerland, in an email to the newspaper, had confirmed that the UK had sought for mutual legal assistance from its country. In an e-mail sent to it, the office of the AGF of Switzerland was asked if it had received extradition request from the UK on the businessman. It was also asked to specify the time the extradition process would begin and when he would be extradited. Magu told the lawmakers that at a time the commission was stepping up the anti-graft war, the Ministry of Budget and National Planning cut its overheads by over N1bn this year. He complained that the budget cut would affect the operations of the agency, particularly investigations into corruption allegations. Although he admitted being aware that government’s revenue had dwindled due to a sharp fall in crude oil prices, Magu argued that corruption-fighting was capital-intensive. Magu also spoke of plans by the agency to recruit 750 personnel this year in its bid to build its core members of staff and reduce the number of its operatives on secondment from other organisations. 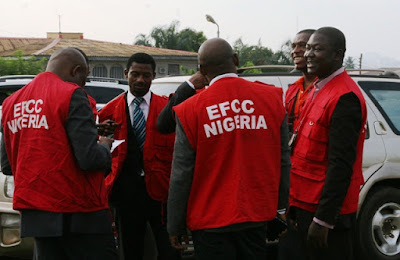 Ironically, the budget ministry cut the EFCC’s personnel cost for this year by 6.5 per cent. In 2015, the personnel cost for 2,173 employees was N7.1bn. The Chairman of the committee, Mr. Kayode Oladele, nonetheless, made promises that the House would look into the complaints of the EFCC. He said, “As we all know, the current economic downturn has drastically reduced projected earnings for the 2016 fiscal year. “Despite the paucity of funds, the funding of the EFCC remains a priority for the government.